Is your business active on social media? 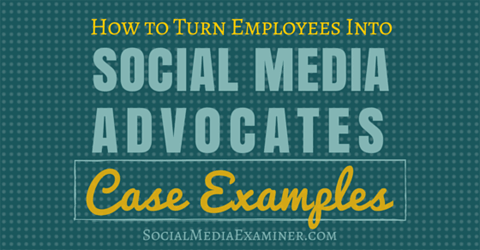 Are your employees social media advocates? 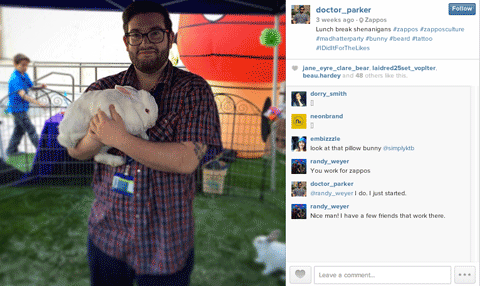 When employees are included in your social efforts, they become important brand advocates. In this article you’ll discover how involving employees in your social media marketing benefits your business. Thanks to Liz Azyan for writing this informative article. Discover how to turn employees into social media advocates. Zappos, the online shoe, clothing and accessories retailer, has an incredibly open and social culture. Here are just a few of the ways Zappos uses social media to support and share their unique culture. By making their company culture more visible on social media, Zappos not only attracts customers who appreciate how well they treat employees, but also draws in potential candidates who might want to work for the company. Zappos believes that even the most mundane activity, like a job interview, is an experience worth sharing. By involving prospects in social media at every stage of their relationship with your business, your brand shows its personality. 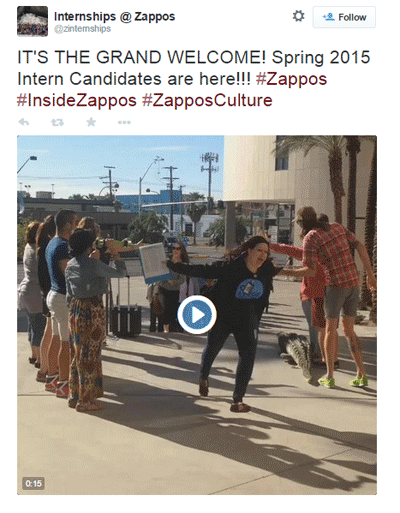 The video tweet below shows how Zappos warmly welcomes their interns. Telling your brand’s story through images and video lets people outside your company to understand your culture. 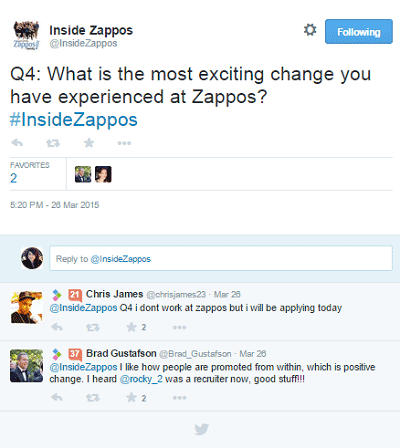 Zappos uses the Twitter account @eyezapp to show others what it’s like to work for them and uses @InsideZappos to host the #InsideZappos tweetchat to share what happens behind the scenes. The chat engages their employees in a transparent way. Set up a dedicated account and hashtag for tweetchats. As you host regular chats, your brand will show itself to be transparent and attract like-minded applicants. Zappos is great at using social media to reinforce the message that businesses are powered by people, not numbers. Once on board, they train each employee to use Twitter. Employees are encouraged to tweet about what they’re doing at work and share resources that customers might find useful, both on and off the Zappos site. There’s even a company leaderboard that shows which employees are on Twitter and how many followers they have. To encourage employees to share photos of their work life, give them the training and tools they’ll need. Employees use a number of social networks and tag their social posts with the hashtags #ZapposCulture and #Zapponians. 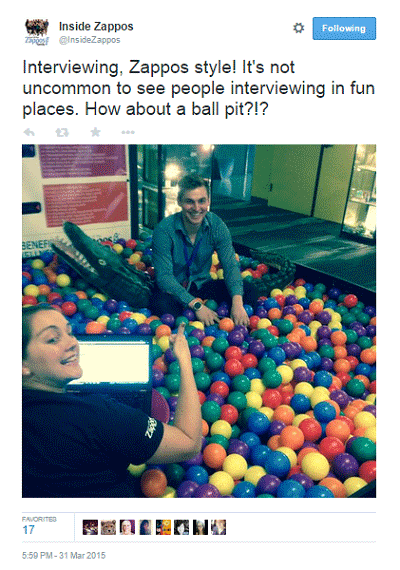 And they sometimes use the hashtag #companyculture to reach an audience beyond Zappos. Takeaway: Zappos has laid the right foundation to encourage employees to participate in social media. With buy-in from their social media–savvy CEO, Tony Hsieh, the company’s social media strategy allows the company and employees to grow together. Zappos’ dedication to customer service and their great company culture are clearly visible on social media, and that has had a huge impact on their sales, reputation and branding. Providing great customer service and employee support through social media sustains Zappos’ reputation. 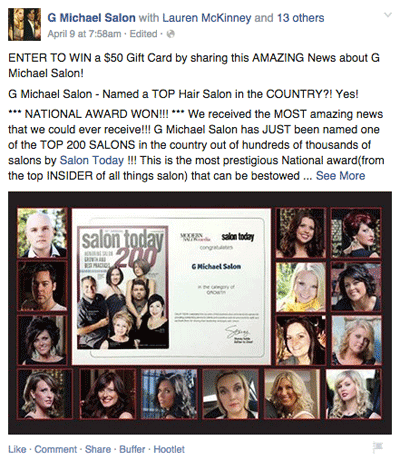 G Michael Salon is a top Indianapolis hair salon. Its Facebook page is a great example of how a service-based business can keep a company’s image fresh and current by highlighting employees in social media posts. 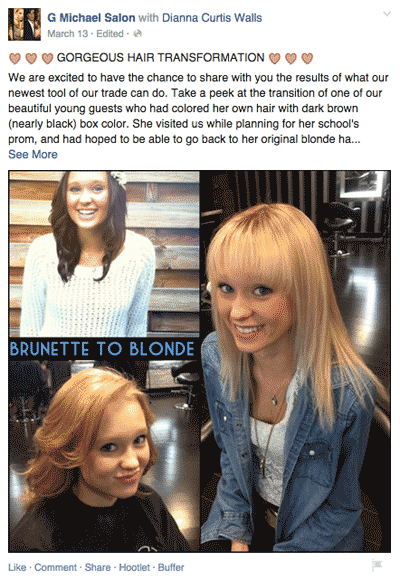 G Michael Salon familiarizes customers with its stylists and their work by posting before-and-after photos, along with the employees’ names. If customers like what they see, they can request services from those stylists, resulting in increased sales. If you’re a service-based business, showing what your employees can do gives customers confidence in booking with you. 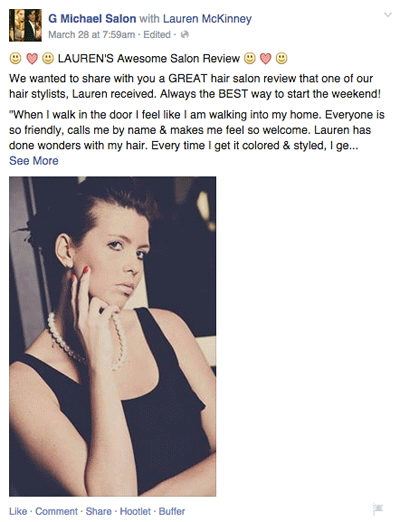 The salon makes it a point to post reviews from satisfied customers and tags the stylist who is mentioned, showing the quality of their work and encouraging more bookings. Post customer reviews on social media to share how satisfied customers feel about their experience. G Michael Salon shares the professional training and certifications of its employees to instill customers’ confidence in their decision to schedule an appointment. Similarly, when the salon reaches a goal or receives awards, they tag the employees who contributed to the success. Tag employees when posting about a company achievement to build the reach of your update beyond that of your page audience. 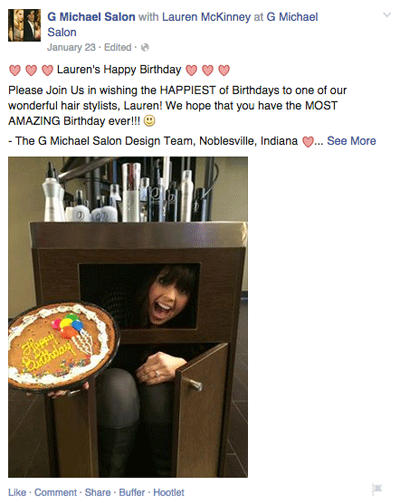 The salon celebrates employees’ birthdays or weddings to help create personal bonds between stylists customers. Share important employee milestones on social media. To further build those connections, the salon shares the outside interests of their employees, thereby attracting customers who have the same interests. Sharing personal interests helps you build stronger relationships with customers who share those interests. Takeaway: G Michael Salon understands relationships are often built through common interests between people, not brands. 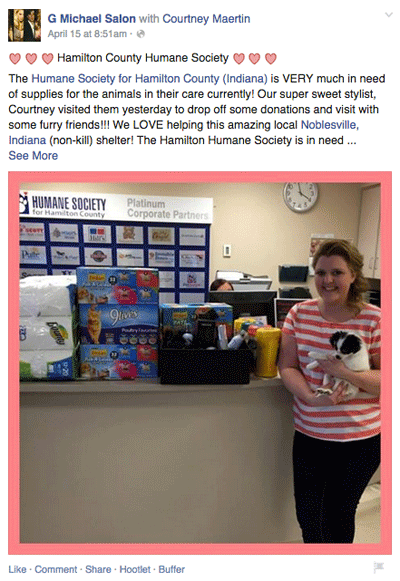 They make it a point to include the people behind their business in their social media updates. When those employees share those updates with their friends, the reach of each post is increased and more people become aware of the business and its services. Make sure company leadership is on board with your social strategy. Establish social media guidelines that highlight the do’s and don’ts that your employees should adhere to. Train employees to represent the company well. Use a tool like Nimble to ensure you have one voice and a single contact record. Select people who are excited to get involved. Don’t push social media to people who aren’t interested, because they won’t give the energy it needs to be successful. Send employees interesting social media updates via internal social networks (like Yammer) to encourage sharing on their personal accounts. This will help increase your reach and align employees with your company’s social media strategy. I would like to leave you with this thought. A company’s culture is reflected both internally and externally. Therefore, a company’s social media presence is not just external—it’s internal, too. What do you think? Have you tried any of these tactics to get your employees involved in social media? What best practices do you use in your company? Please leave your thoughts in the comments below. I would love to hear from you!